Search Engine Optimization is an inexpensive and affordable way of advertising on the Internet, helping you to reach your target audience in the most effective manner. We know all the right moves in using local and global Search Engine Optimization techniques to increase your businesses or Organizations visibility on the Internet. and rankings. Our process is simple. We will complete a keyword analysis and audit of your website, research the best keywords to bring only targeted traffic to your website. As studies show, it takes approximately 3-4 months (for domains registered longer than a year) to rank your website on the to 10 search results for highly competitive keywords. This time frame varies greatly depending on search engine algorithms, your competitors SEO activity, and various other factors. It is extremely difficult to accelerate the SEO process, as Search Engines know how to track and lower rank for those that choose to 'over-optimization. Our team works closely and in accordance with the Google Webmaster Guidelines to ensure you will receive sustainable ranking and will not be delisted by Google. Full SEO analysis of websites technical aspects and optimization options. Content Analysis, optimize website content for SEO. HTML, CSS, and code optimization to make your site more SEO friendly. 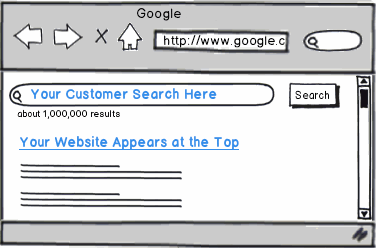 Optimized site navigation for visitors and search engine crawlers. Search engine optimization will not only improve ranking, but also attract targeted traffic and increase the number of calls to your office and sales from your site. Our goal is to bring the maximum amount of potential customers to your website using search engines organic (non-paid) traffic. The number one SEO activity to increase your traffic is by building back links to your site. When building back links we follow the Google Webmaster Guidelines. We do not spam, use link farms or directories, or any other "black-hat" SEO methods. In addition to our SEO program you can also take advantage of using paid advertising networks such as Google AdWords and Facebook to increase traffic to your website. With these advertising methods your campaign is setup with the same keywords and targets as your SEO program, you are then billed for each click or impression your ads receive. Using Paid advertising networks can give your site that boost in traffic you need, to assist with generating leads and sales. We have established an affiliation with Google and frequently have advertising credits for new clients, this is a great way to get started with your advertising campaign. Contact us to learn more and how you can get started with paid advertising. SEO services are priced on monthly terms, and start from $250.00 a month. The estimated time for your website to appear on the top 10 results in search engines for low competitive keywords is about 2 months. For medium competitive keywords 3-4 months. For highly competitive keywords 5 - 6 months. The average time for improving your ranking to top 10 is dependant on the competitive position of your keywords. Your SEO package will be adjusted after your website has reached top 5 or top 10.